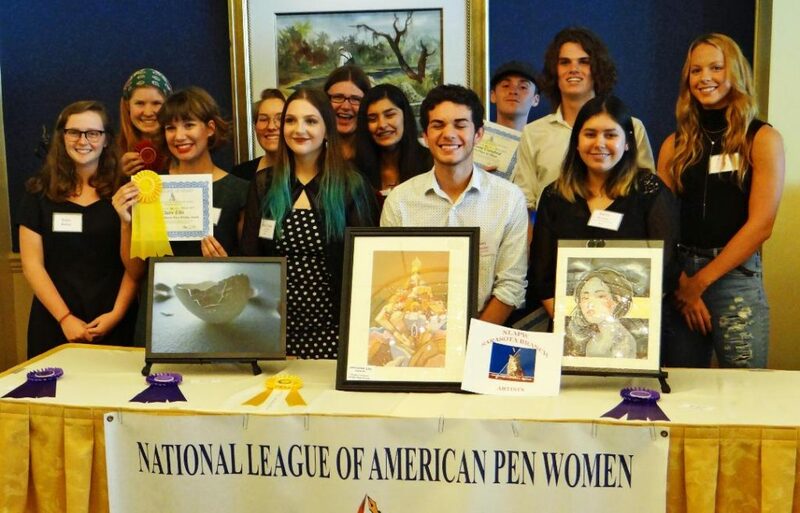 The National League of American Pen Women (NLAPW) – Sarasota Branch presented awards to high school seniors from Manatee and Sarasota schools in Writing, Visual Arts and Music on March 8, 2019 at the Bird Key Yacht Club in Sarasota. The awards are based on competitions and encourage the students to pursue further education in the arts. The awardees read their compositions and poetry, displayed their artwork, and performed musical pieces at the event. The Dr. Sylvia Anderson Price Writing Award was presented to Claire Ellis (Venice High School) for “First Impressions”. Mina Quesen (Braden River High School) earned First Place for “Third Born” and Julia Weber (Riverview High School) received Second Place for “Can’t Dance”. Ryley Ober (Bayshore High School) for “A Screen to the World” and Cassandra Atzrodt for “How Mozart Taught Me Leadership” both earned third place awards. Pictured are award winners (L to R): Julia Weber, Claire Ellis, Emily Aviles, Sophia Sahr, Zainab Farooq, Zachary Timmons, Bryant Crawford, Anthony Bilotta, Emily Aviles and Ryley Ober. The David Altman Foundation, in memory of NLAPW member Betty Altman, provided the Visual Arts awards. Amy Portillo (Bayshore High School) received “The Betty Altman Special Art Award of Excellence” for “Under the Sea”. “Betty Altman Special Awards” were awarded to: Emily Aviles (North Port High School) “Imbrication”, Bianca Johnson (North Port High School) “The Power of History”, Sophia Sahr (Lakewood Ranch High School) “The Ultimate Egg” and Zachary Timmons (Booker High School) “Jerusalem City”. First Place in music was awarded to Bryant Crawford from Manatee School for the Arts “Arroyo”. Second Place for “The River Chases” to Zainab Farooq (Venice High School). Third Place to Anthony Bilotta (Sarasota High School) for “C’est un Jeu D’enfant”. The National League of American Pen Women is a nationwide organization of professional writers, artists and musicians founded in 1897. The headquarters is in Washington, DC. Sarasota Branch members who chaired the event were Audre Marans, Jana Millstone, Amy A. Elder, Madelaine Ginsberg, Judy Allen, Jan Eberle Schaberg, Dr. Alice Moerk and Barbara Jendrysik.